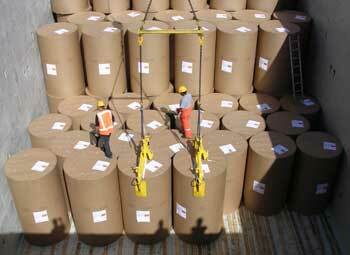 The paper roll headclamps are designed for heavy duty crane operations. For handling vertical paper rolls. Typically these clamps are used for ship-loading and unloading. The headclamps have a large adjustable opening range. Contact pads are coated with profiled rubber for the best possible friction. Bottomside protected to prevent roll damage. Capacities 2, 3 and 5 tons, opening ranges 900-1300 and 1100-1600 mm. Other capacities, opening range on request, frames available for multi-roll handling.